In march 2018 the Museum Posterstein Castle opened a special part in its permanent exhibition. 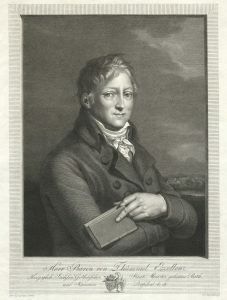 The Topic was the minister Hans Wilhelm von Thümmel (1744-1824). This remarkable man was a friend oft he Duchess Anna Dorothea of Courland (1761-1821) and regular guest at her castles in Löbichau and Tannenfeld. With today’s subject #natureMW during the international #MuseumWeek 2018 we want to present Hans Wilhelm von Thümmels gardens. As head of goverment Hans Wilhelm von Thümmel was one oft he most famous persons in the Altenburg part of the duchy Saxony-Gotha-Altenburg. And a minister close to nature. As a confidant of the Gotha Dukes, he represented the duchy as a diplomat in Paris, Berlin, Vienna and Denmark. 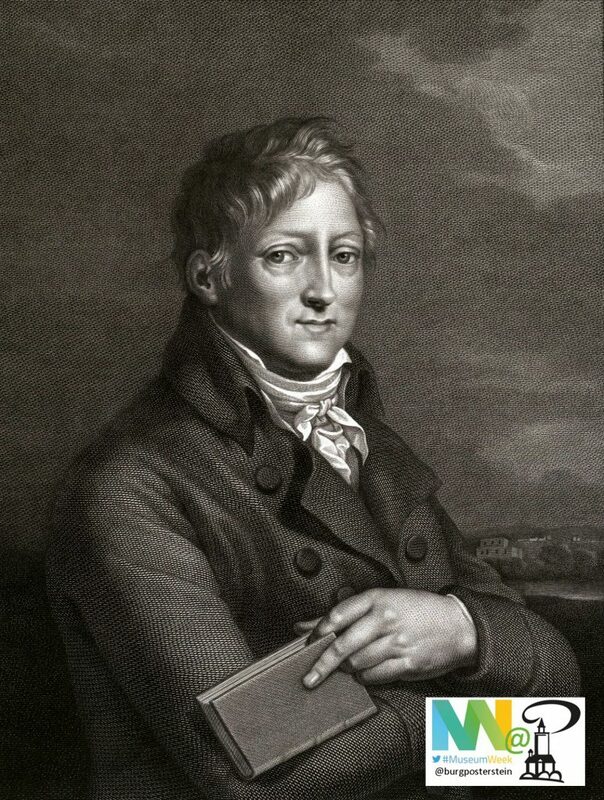 He initiated the geodetic surveying of the duchy and left behind a comprehensive landscape heritage. But often it did not last. His harmony with nature can be guessed not only at his extraordinary and beautiful tomb: the 1000-year-old oak in Nöbdenitz. It can be guessed at his horticultural heritage: for example Thümmel’s private English garden with a palace in Altenburg, his manors in Nöbdenitz and Untschen, the “Polish cottage” in Münsa, or the palace garden in Altenburg. These gardens were not only seen as places of recreation and entertainment in the countryside, but also as educational establishment: as gardens of the Enlightenment. 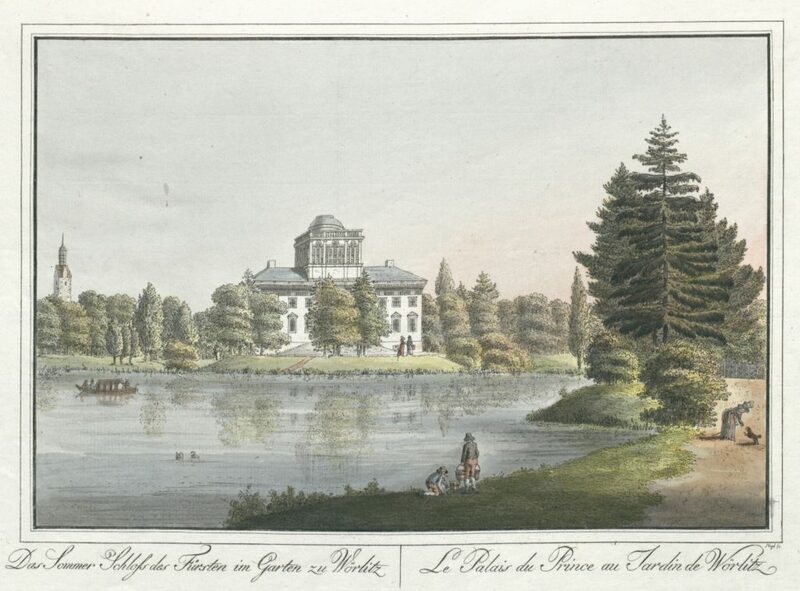 Le Palais du Prince au Jardin de Wörlitz | Nagel, Johann Friedrich (Public Domain, Österreichische Nationalbibliothek). At the beginning of the 19th century, the garden of Hans Wilhelm von Thümmel was considered as one of the most important sights of Altenburg. In its final extension, the long park ground was enclosed by a wall with seven gates. At the highest point of the site, with the best view of Altenburg, Thümmel had a villa built in 1788 in the style of Italian classicism. The park had artificial grottoes, streams and ponds. Small pleasure houses in different styles as well as the so-called “Kachelhaus” – or “Turkish Pavilion” – were integrated into the concept. The well-known artist Adrian Zingg captured the beauty of the Thümmel garden for eternity in his pictures. Thümmel’s garden in Altenburg on the Thümmel map from 1813, section VIII. As Thümmels legacy the garden did not last long. Several decades after his death in 1824 the garden had been greatly reduced by Thümmels heirs by selling several areas. Today, only the preserved central building of the palace reminds of its former glory. In addition to the design of his private garden in Altenburg Hans Wilhelm von Thümmel was also involved in the transformation of the palace park Altenburg from baroque to landscaped grounds.According to reports of the Altenburger Chronicler Christian Friedrich Schadewitz (1779-1847), the chamber president Thümmel had already 1784/86 removed yew tree figures as well as the hedged. The open spaces were laid out with grass and a new orangery was placed on it. 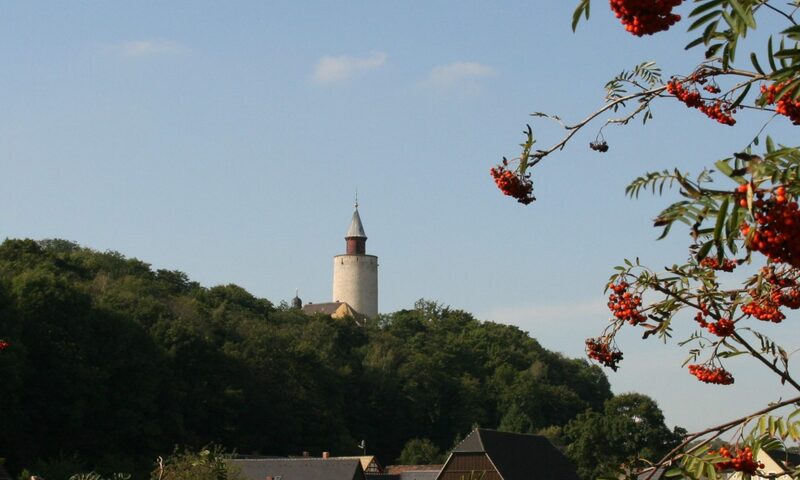 Around 1800, the first tulip trees were planted and formed the foundation for today’s English Park of Altenburg Castle. 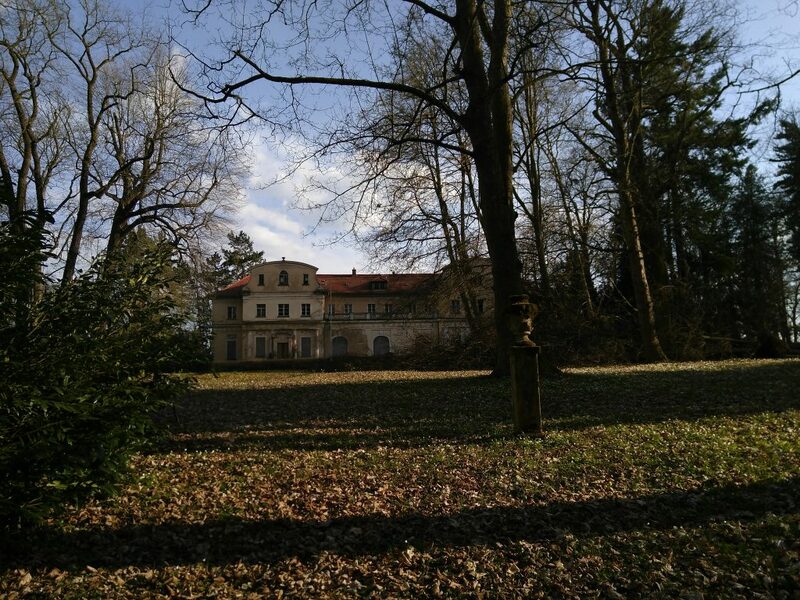 Hans Wilhelm von Thümmel came into the possession of the manors Nöbdenitz and Untschen by marriage.Especially the park around the estate Nöbdenitz with its romantic hermitage met with universal approval. In 1782, Thümmel’s father-in-law and predecessor in office, Johann von Rothkirch und Trach (1710-1782), had the old Nöbdenitz castle renovated and a new mansion built, as well as a mausoleum as family grave. Thümmel chose this peaceful place as his old-age residence. Nöbdenitz is very close to the castles Löbichau and Tannenfeld, in which the duchess Anna Dorothea of Courland invited guests to her well-known salon. But also visits by the Duchess and her guests in Nöbdenitz at Thümmels house were usual events. Here they met to sail on the large pond of the manor and took walks to the 1000-year-old oak, which Thümmel had chosen as his future grave. Castle and manor house in Nöbdenitz – Hans Wilhelm von Thümmel had an english garden (lithografie: Museum Burg Posterstein). The surrounding park extended east of the 1782 built “New Manor House” whose perron led down to the garden. A little brook – the “millrace” – flowed through the park. Figures or rondels had been placed at partings of the way. From the main way three bridges led over the millrace into the landscape on the south side, which was enclosed by a wood. A hermitage had been built next to the weir at the millrace. It was a popular motif in the gardens of the Enlightenment. The hermitage was a quiet place of contemplation amidst nature, a place where one be able to communicate with oneself, nature and God. This hermitage in Nöbdenitz was also pictured by the engraver Zingg. The building itself doesn’t exist anymore. 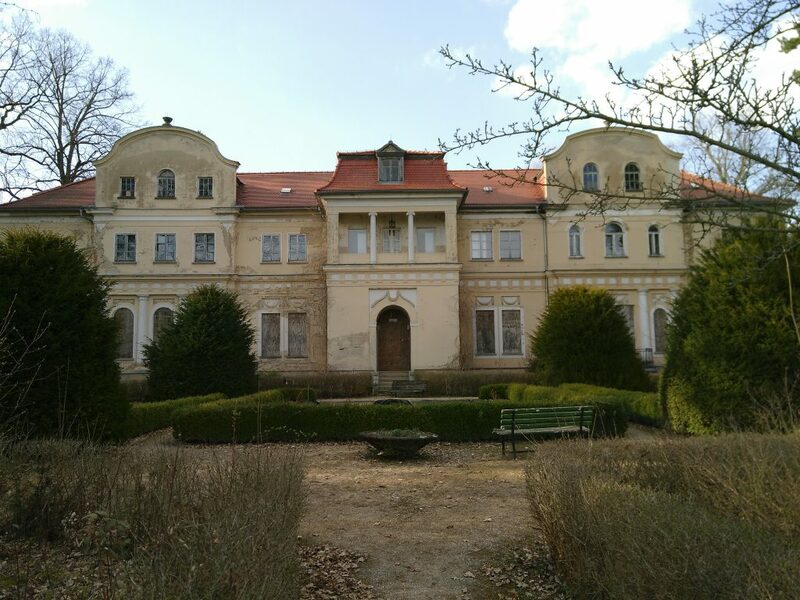 Also the redesign of Untschen manor including the establishment of a bathhouse in the Chinese style or the creation of the destination “Polish cottage” in Münsa were realized under Thümmels direction. But he was not the only one who appreciated and promoted the local garden art. The much-admired duchess Anna Dorothea of Courland, also belonged to this circle. The english garden in Tannenfeld in spring 2018. Contemporaneous with the building of Tannenfeld Castle also the development of Tannenfeld park started under the direction of the Duchess of Courland. The new building, with a beautiful view to Posterstein Castle, was embedded in the new landscape park. At the time of Anna Dorothea of Courland Tannenfeld was about half an hour away from Löbichau. If the visitors turned from the main road between Ronneburg and Schmölln to Tannenfeld, they passed a small gatehouse and through an alley lined with Italian poplars they came to park and castle. Sandy paths led the walkers past groups of trees or shrubs and sentimental-romantic memorial stones. One stone was bearing the inscription “Peterswiese” and reminded of the 1800 deceased husband of Dorothea of ​​Courland. A narrow stream flowed through the meadow and ended in a pond. On an island in the pond there was the so-called “Hermitage”, a grotto formed of rocks. From 17th June to 9th September 2018, the Museum Burg Posterstein dedicates a special exhibition to Tannenfeld Castle and its park: “#SalonEuropa – Europe in the Here and Now: Tannenfeld Castle – Inspiration and Reality”. Four artists from Germany, France and Poland – Petra Herrmann (installation art) and Jana Borath (photography) from Thuringia/Germany, Marta Pabian (installation art) from Poland and Verok Gnos (painting) from France – continue the tradition of the salon with this artistic dialogue. In the summer of 2018 the castle and park at Tannenfeld will be entering a new era. With their Project the four Artists want to resuscitate and reference this European Idea that was so current under the care of Anna Dorothea, and through their works articulate their respective viewpoints on the European House. 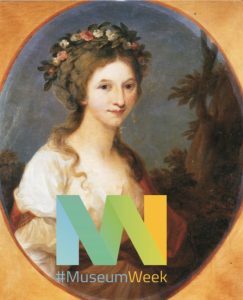 On the first day of this year’s international #MuseumWeek women take centre stage. The Hashtag #WomenMW leads us to Löbichau Castle and Tannenfeld Castle near Posterstein. Between 1795 and 1821 there was a living salon in both castles. 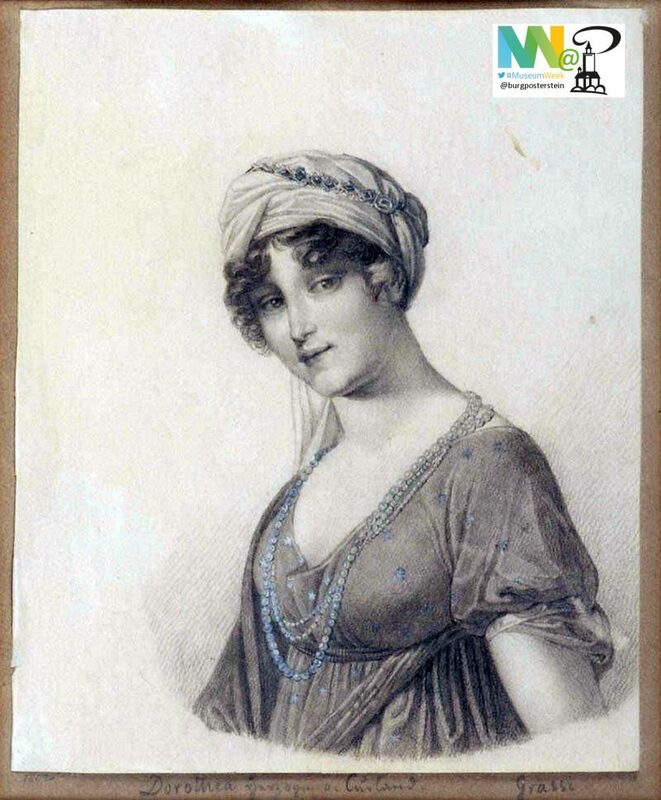 The hostess was the beautiful duchess Anna Dorothea of Kurland (1761–1821), one of the most impressive salonniéres of her time. But also among her guests in Löbichau, important women can be found – like Emilie von Binzer. The salon of the Duchess of Courland was one of the most famous of its kind at the beginning of the 19th century. With the 18th century Parisian salons, where members of the court, scholars and artists met, a culture emerged during the Enlightenment, spreading throughout Europe. At the end of the 18th century Löbichau Castle became such a center of intellectual and cultural life in Germany. The salon of the Duchess of Courland was one of the most famous of its kind at the beginning of the 19th century. In 2014 the Museum Posterstein Castle – promoted by financial resources of the Free State of Thuringia and from Bürgerstiftung Altenburger Land – could purchase a unique collection of portrait drawings. The 47 watercolored drawings date back to 1819/20 and represent the guests in the salon of the Duchess of Courland as mythical creatures. The unique pieces were stored in a box made of dark green colored half leather. The authors of these amusing portraits are the painter Ernst Welker and probably also his pupil Emilie von Binzer, née von Gerschau (see picture above, which has the signature “Emilie del”). Emilie was a foster daughter of the Duchess Wilhelmine of Sagan, the eldest daughter of Dorothea of ​​Courland. The drawing of the caricatures is described by Binzer in her memoir “Three Summers in Löbichau” („Drei Sommer in Löbichau“). One can imagine the drawing teacher aged 35 and his pupil at the tender age of 19 spending a summer on the idyllic country estate Löbichau and Tannenfeld and throw a humorous glance at the famous and lesser-known guests in the salon of the Duchess of Courland. The salon visitors are pictured as mythical creatures, mostly in animal form or as an object with a human portrait head. It’s a moot question whether the persons knew about the existence of these drawings. The authors of the caricatures did not spare themselves: Emilie is depicted as an asparagus, Welker as an oyster. The writer Emilie Henriette Adelheid von Binzer (1801-1891), née von Gerschau, was born in Berlin. She lived with her aunt Wilhelmine of Sagan and two other foster daugters. Her father Peter von Gerschau is said to have been an illegitimate son of the Duke of Courland. He served as Russian Consul General in Copenhagen. Duchess Wilhelmine introduced her to the salon life and so the young girl met famous personalities, such as Metternich, Talleyrand, Tsar Alexander, Windischgrätz, Wellington, Blücher and Schwarzenberg. In 1819/20 Emilie stayed in Löbichau und Tannenfeld together with Wilhelmine of Sagan and her teacher Ernst Welker. More than 50 years later, she wrote her memoir “Three summers in Löbichau” („Drei Sommer in Löbichau“), in which she individually characterizes the people portrayed by Welker. 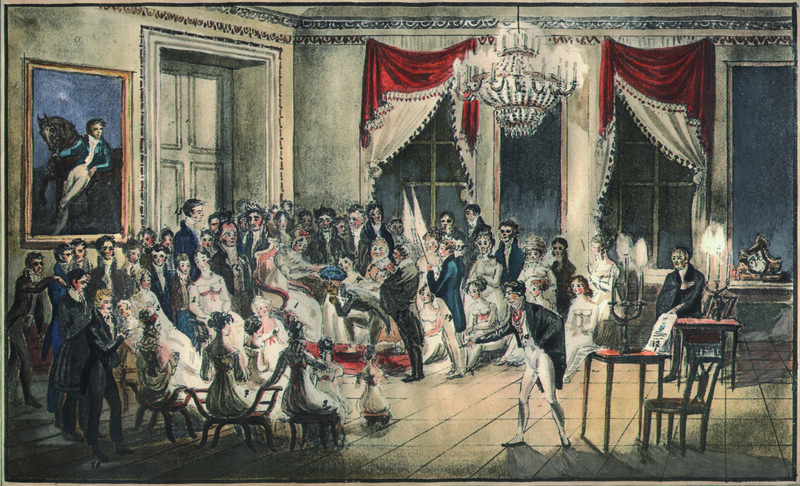 In Löbichau Emilie met among others the poet Jean Paul, Families Körner and Feuerbach, Carl August Böttiger, Friedrich Arnold Brockhaus, Christoph August Tiedge and Elisa von der Recke. Here she also became acquainted with her future husband: the Burschenschaftler (member of a student fraternity) August Daniel von Binzer. They married in 1822 in Sagan Castle. By using the pseudonym „Ernst Ritter“ Emilie von Binzer published a collection of novellas entitled „Mohnkörner“ („poppy grains“). In particular, people and experiences of the time of the Congress of Vienna influenced her literary work. She formed a close friendship with Adalbert Stifter and Franz Grillparzer. In 2015 the Museum Posterstein Castle showed the collection of caricatures drawn by Ernst Welker for the first time within the framework of a special exhibition. Afterwards, the pictures were integrated to a touchscreen in the museum’s permanent exhibition. 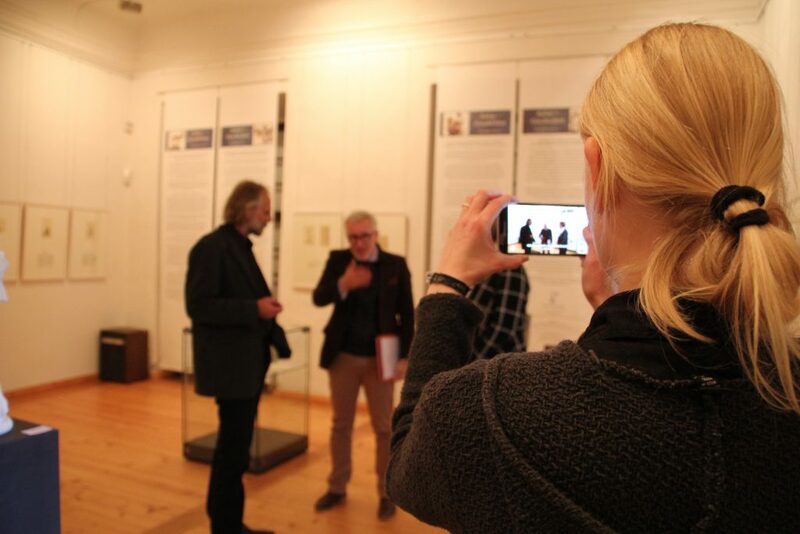 Since 2018 they are digitized and accessible via platform “Museums in Thuringia”. For the cultural hackathon Coding Da Vinci East the leaves are now to find in high resolution and with CC-BY-SA license also on Wikimedia Commons. Our first hackathon: the Welker collection takes part in the hackathon Coding da Vinci in the university library in Leipzig. 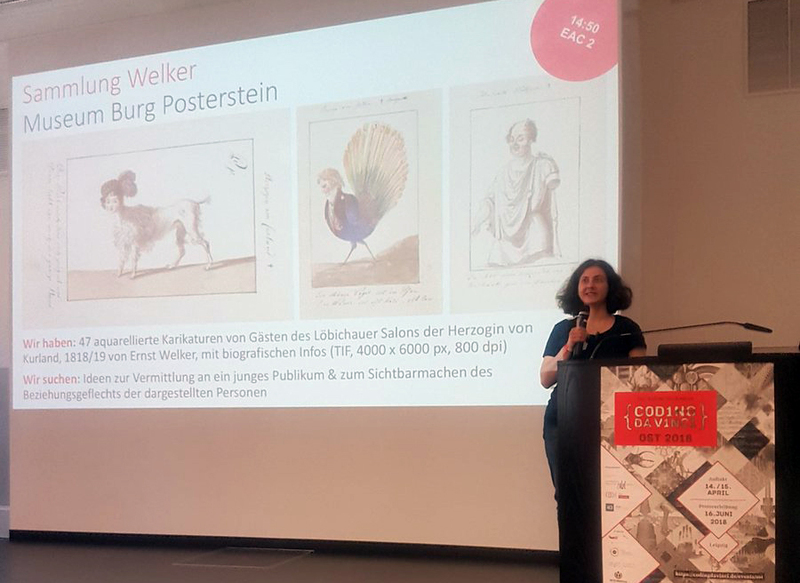 In context of the hackathon some of the 140 participants – including designers, programmers and students of various disciplines – work with the data of the Museum Posterstein Castle. For the next nine weeks they’ll spend their free time to create modern playful applications by using the playful historical drawings. We will support them with professional information and we are very excited about the results, which will be presented on the 16th of June! The projects can be followed in the Coding da Vinci Hackdash. There is even still the opportunity to join the project. MuseumWeek: we want to put travelling around 1800 in focus. Travel was undertaken on very different occasions. Scholars traveled to carry out their researches, to multiply and exchange knowledge. Young aristocrats were sent on “Cavalier’s Tours”, so that they could acquire the foundation of their training for the later court service at the foreign courts with the highest reputation. Travel to the Baths in Pyrmont or Karlsbad boomed. Artists flocked into the pulsating centers of European culture. A classic travel destination was Rome. The focus on antiquity and the classical educational idea brought about a whole new travel culture – the educational journey. At first a privilege of the nobility, it became cultivated by the bourgeoisie. Those staying home could read the travelers’ experiences in their travel tales and journals. Landscapes, habits, culture and art were described therein as well as travel itself, political daily business or martial events. A whole industry of publishing houses was concerned with the publication of travel reports. Löbichau Castle. Around 1800 it was usual to travel with the horse-drawn carriage. Poor roads, little light and hardly feathered coaches could quickly make the travel experience difficult. Traveling at this time also meant hassle and abstinence of comfort. The roads were unsafe, in bad condition, dirty and even in large cities not always lit. Beds in the inns were infested with bugs. The horse-drawn carriages, poorly cushioned and ice cold in the winter, rocked and shook the passengers and brought little in comfort. In France, Napoleon had straight avenues built, and good road connections were also reported from England. But in Germany most roads were unstable and poorly developed. There was often talk of axle breaks in the wagons, and it was not unlikely that the constant repairs to infrastructure and equipment were to generate good revenue for the local craftsmen. Tolls and passport checks at the border stations cost time and money or even delayed the journey. Accordingly, trips took time, and it is said the distance from Berlin to Rome would have taken about two months to travel. Salon host Anna Dorothea of Courland travelled through Europe many times. Near the end of the 18th century, Castle Löbichau, along with the Tannenfeld Castle, developed into a center of intellectual and cultural life in Germany, just two kilometers from Posterstein. 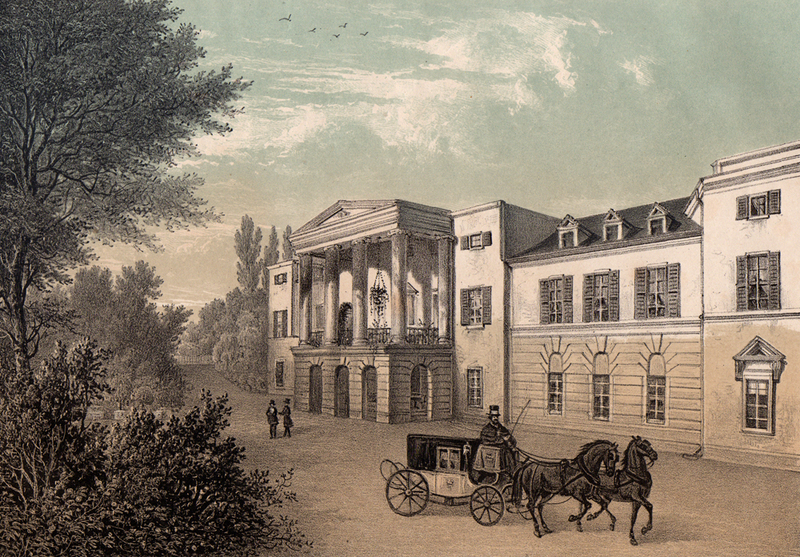 The Musenhof der Herzogin von Kurland of the Duchess of Courland, Dorothea of ​​Courland (1761-1821), in Löbichau was one of the most famous of its kind. The well-educated noblewoman drew important impulses from her first-class relations with the highest social circles in Europe and the associated network, and from her stays in famous salons of Berlin and Paris, as well as in the fashionable Carlsbad. She was acquainted with several important statesmen of her time. 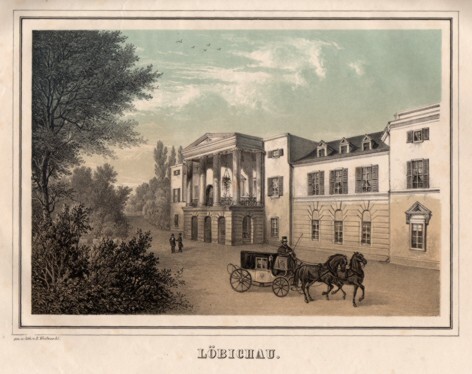 Since the estates in Löbichau and Tannenfeld were conveniently located between the German cultural centers of the time, Anna Dorothea of ​​Kurland transformed them into a meeting place for the European elite by inviting artists, philosophers and leading politicians of her time. The most famous guest may well have been Czar Alexander I. of Russia (1777-1825). The Duchess had chosen her estates not without reason. The two castles touched important routes of her time – strategically favorable, halfway between Berlin and Carlsbad, between Dresden and Erfurt and close to the intellectual centers of this time: Weimar and Jena. The nearby Ronneburg was still a health resort in the lifetime of the Duchess and thus a popular destination. The travel experiences, at that time still in coaches, completely differed from the ones we make today. Nature, landscape and even the streets were perceived differently. A well-developed infrastructure enhanced the well-being of travelers. Breeches and bumps on the other hand could turn the trip into a seemingly endless odyssey. Hans Wilhelm von Thümmel’s priority were good streets and maps. During one of her trips to Carlsbad Anna Dorothea of Courland met Johann Wolfgang von Goethe. It was just one of many encounters with poets, thinkers, politicians and well-known personalities of society. 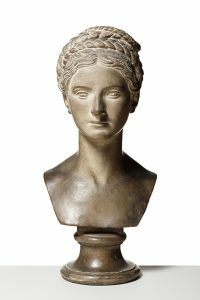 The Duchess had some formal encounters with Goethe in 1808, 1810, 1812 and 1820. In 1820 the poet even followed an invitation to Löbichau. 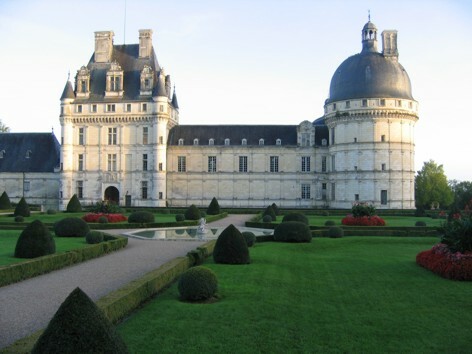 On the 29th and 30th of September he spends cheerful hours and describes the castle of the duchess as a “well-located house of joy”. After this visit, he went on to Altenburg. The Duchess of Courland traveled much herself, and with pleasure. Paris, St. Petersburg or Vienna, Kurland, Switzerland or Italy – she was always drawn back to Löbichau. Thus is the case with her last journey in 1821. In May 1821 she finally set out from Paris, with her health in a bad condition at this time. The change from Paris to Löbichau is supposed to ease her suffering. On 30 June 1821 the Duchess’ two daughters, Pauline and Johanna, leave. The mother describes this day as “a day of great mourning”. She will not see her daughters again. On Aug. 20, Anna Dorothea of ​​Courland dies in her castle in Löbichau. The daughters are already in Switzerland at this time. It’s not until May 9, 1822 that Johanna returned to Löbichau. For the Duchess’ funeral on August 29, 1821, 7000 guests arrived. The last day of #MuseumWeek 2016 on Twitter is dedicated to LOVE and we guess the motto of the day is not only about all the Twitter hearts given to favorite tweets in this week. That’s why we want to present one of our favorite research subjects: European salon culture around 1800, which is involving a lot of love stories, too. Napoleon’s death mask next to a bust of Dorothee de Dino-Talleyrand at Museum Burg Posterstein. Not the first thing to think of when talking about a medievial castle. But only a view kilometres away from the regional history museum Burg Posterstein a popular salon hostess had her summer residence: Anna Dorothea of Courland (1761–1821) in the castle of Löbichau. Born in today’s Latvia the rich Duchess had wide connections to Europe’s high society. That’s why Napoleon’s death mask is one of the first things to see, when you enter the salon culture exhibition in Posterstein. First enthousiastic about him, the Duchess of Courland became much more opposed against Napoleon during the time. She cultivated a livelong friendship to the French statesman Charles Maurice de Talleyrand (1754–1834). Tsar Alexander I. (1777-1825) visited her 1808 in Löbichau and conveyed the marriage of her youngest daughter Dorothée (1793–1862) to Talleyrand’s nephew. At the Congress of Vienna Dorothee de Dino-Talleyrand accompanied Talleyrand and after his death she became his sole heir. 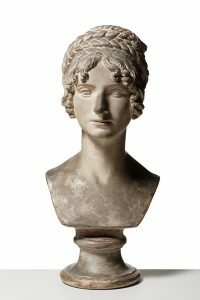 Bertel Thorvaldsen: Wilhelmine Benigna Biron, 1818, Originalmodel. Gips. 58 cm; Thorvaldsens Museum, Inv.-Nr. 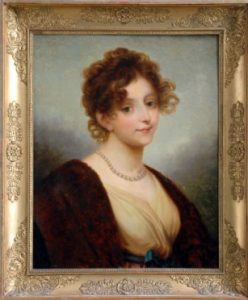 : A312[/caption]Anna Dorothea of Courlands oldest daughter Wilhelmine von Sagan (1781–1839) gained great influence an the congress as well, as she led a popular salon in Schenkenstraße in Vienna. 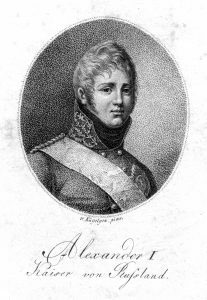 From 1813 to 1815 she had a passonate relationship with Clemens von Metternich (1773–1859), the leader of the congress. In Löbichau Anna Dorothea of Courland brought together poets, politicans and artists. Museum Burg Posterstein has been doing intensive research about her live and the lives of her daughters for more than 20 years. 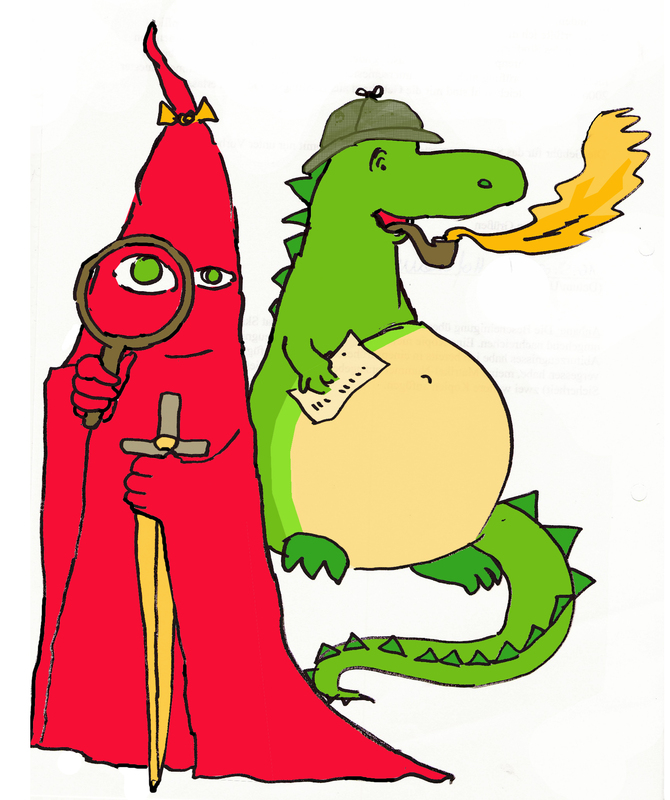 The museum is cooperating with the French history society Les Amis de Talleyrand. The cooperation was officially recorded with a contract between the Museum society Burg Posterstein (Museumsverein Burg Posterstein) and Les Amis de Talleyrand in 2015. Karl Philipp Fürst zu Schwarzenberg, commander-in-chief of the 1813 allied armies against Napoleon, planned to occupy the town Altenburg as a strategically important place. From Altenburg further military actions against Napoleon could be planned. Also the Saxon, Russian and Prussian general Johann Adolf Freiherr von Thielemann (1765-1824) emphasized in a letter to Schwarzenberg on October 3rd 1813 the militarily advantages of the town, that has a castle lying high up on a hill that could easily be defended. In fact Altenburg was the right place to accommodate thousands of soldiers as well as supreme commanders, generals, diplomats and their entourage over a longer period. 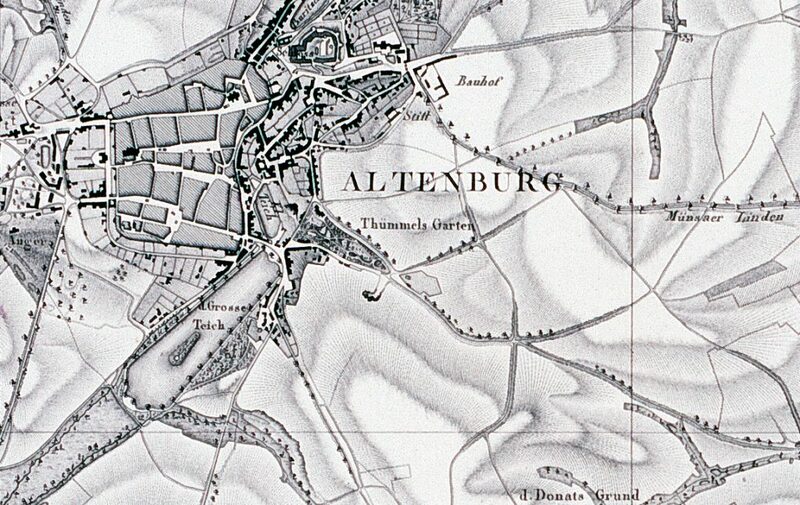 On October 7th 1813 the allied troops occupied Altenburg. The headquarters were moved there from the town Penig. Tsar Alexander I. arrived on the same day and resided in Altenburg castle. Thereafter the Austrian foreign minister Metternich, the English legate Cathcart, the Russian diplomat Nesselrode and other politicians and important brass arrived. On October 14th the Austrian emperor Franz received a message from Schwarzenberg that a stay in Altenburg would be save. The Prussian king and the Austrian emperor reached Altenburg on October 15th and stayed in the castle as well. In the year 1813 altogether 671 generals, 46.617 officers and 472.399 soldiers have been accommodated in the small town Altenburg, that had about 10.000 inhabitants at that time. Only in September and October 1813 the town spent the unbelievable amount of 147.681 thaler on the supply of the troops. 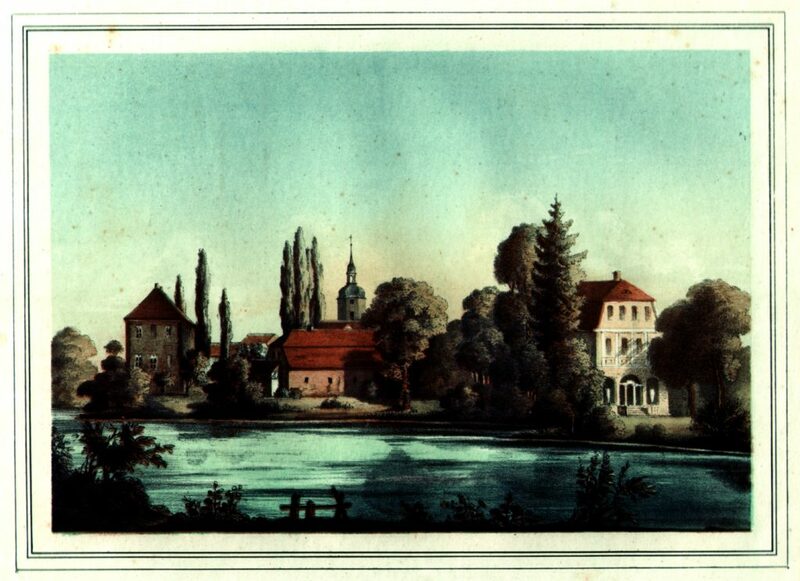 There is existing a detailed record (view here on Google books) on the year 1813 in Altenburg, written by the minister of finance of the town Altenburg, Friedrich Wagner (1792-1859). He is describing, how the citizens of Altenburg, all the villages and farms near-by and other towns in the neighbourhood (as Borna, Meuselwitz, Gera, Zeitz) had to deliver a substantial quantity of food, cattle, textiles and other things to the different armies. Prisoners and wounded soldiers had to be accommodated and taken care of as well. The canon fire of the battle of Leipzig, 9 hours walk from Altenburg, could be heard in the town as well. After the first fights, masses of wounded soldiers arrived in Altenburg – and with them epidemic deceases. Nearly all official buildings of the town were already used some military hospitals, so that all houses in the Altenburg had to house 2, 3 or more wounded soldiers. The farms and manors in the region felt the war as well. 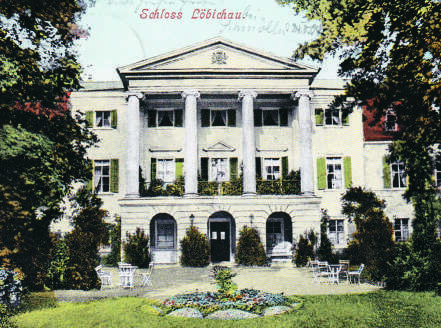 Anna Dorothea Duchess of Courland, who owned the manor Löbichau near Posterstein, wrote in her letters from July and August 1813 that there was no day without soldiers who had to be accommodated. Often they took all food and horses with them. Special war taxes had to be paid and workers and farmers were recruited as soldiers. “Heaven help us to harvest”, the Duchess wrote to her friend. – Years after the wars of liberation from Napoleon the people of Altenburg had to pay special taxes to pay the war debts of the Duchy of Saxon-Altenburg. The Museum Posterstein Castle, regional history museum in the county of Altenburg, shows from September 1st to November 17th 2013 a special exhibition on the battle of Leipzig, which now is 200 years ago. Basis for the exhibitions are about 50 Napoleon caricatures, Wagner’s record of Altenburg in 1813 and original military letters from 1813. On October 13th a book will be published as well (in German). For more information, contact the museum at info@burg-posterstein.de. A motley group of emigrants from Saxony-Altenburg, Dresden region and Hannover stranded on a rock in Mississippi river in 1839. Right beside the river the strict Lutheran settlers founded the town Wittenberg. Frequently the legendary river carried Wittenbergs houses away – that is why only the Wittenberg Boat Club and a crumbling old post office remind of the town today. After a long journey by ship a group of German emigrants from Altenburg County stranded at this rock in Mississippi in 1839. The emigration was organized by different clergymen, under the leadership of reverend Martin Stephan from Pirna near Dresden. As a result of social problems after the Napoleonic Wars and tightened taxes in the countryside, parallel to first revolutionary riots, a lot of people in Altenburg region considered to try out their luck in the „new world“. In the beginning they considered Australia as a new home as well, but south from St. Louis in Missouri they were offered 10.000 acre land to a cheap price. In Winter 1838/39 five ships with settlers from the kingdom of Saxony and the duchy of Saxony-Altenburg headed for the so called „new world“. The devotional emigrates took 900 copies of Luther’s catechism with them on board of the ships. Even during the long crossing the children were taught. All ships reached the US, except for a small boat called „Amalia“, which apparently collided with a bigger ship near France. As mentioned before, the settlers arrived in Missouri in 1839. At that time this region still was a nearly uninhabited wilderness. The newcomers probably wouldn’t have survived the first winter, if they wouldn’t have been supported by the Lutheran community in St. Louis. In today’s Perry County the German settlers founded towns, which they named after the regions and towns they came from – like Dresden, Seelitz, Johannisberg, Altenburg, Frohna, Paitzdorf and Wittenberg. Dresden, Seelitz and Johannisberg were later on suburbanized by Altenburg, Missouri. Of course the emigrants only reported the best things to their friends and families in Germany and in the following years a lot of other people from Altenburg region moved to the new founded Altenburg. Reverend Martin Stephan lived a very little moral life in the new world, while he let himself celebrate as a king. When the community finally had realized how badly their spiritual leader had betrayed them, they dismissed him. The first president of the Missouri synod, which has two million members today, was Ferdinand Wilhelm Walter from Langenchursdorf. Gotthold Heinrich Loeber from Kahla overtook the job as reverend in the new founded Altenburg. In a letter to Germany on September 10th, 1839 he described the life in the new world, where the most people at this time did still not live in houses, but in temporary sheds. To comfort his reader he added that one did not have to fear Indians, wild animals or Mexican soldiers in Altenburg. The school building from 1839 is the oldest house in Altenburg, Missouri. As one of their first projects, the settlers built a school in august 1839 to provide grammar school education for the children: Religion, Latin, Greek, Hebrew, German, French, English, history, geography, mathematics, physics, natural history, philosophy, music and drawing were on the schedule. The goal was to prepare the pupils for later university studies. In the first year seven boys and three girls were enrolled. In October 2010 historians from the German Altenburg travelled to the American Altenburg to take part in an international conference named „Home is where our story begins“. Already decades before the genealogist Wilfried Piehler from Gera (Thuringia) established first contacts to Missouri. Inhabitants from Altenburg, Missouri, have already a few times visited Altenburg County in Germany. Some of them surprised the Germans by speaking German with Altenburg dialect from 19th century. The American Altenburg is a gemuetlich small town with a living Christian community. On the two-day conference local historians and genealogists from Missouri presented their research on the history of the town. German historians, as Sabine Hofmann from Lindenau Museum Altenburg, described the history of the German Altenburg. On Friday, March 18th, 7pm, Wilfried Piehler and Klaus and Sabine Hofmann will present the results of this conference at Posterstein Castle. To learn more about the history of Altenburg, Missouri, you should take a look at the book „Altenburg Missouri and the surrounding Parishes” (editor: Mary Beth Mueller Dillon, Lynhorst, Indianapolis, 2010).